Emily celebrated her birthday with her friends at a pool playdate. We had to move the playdate twice because of sickness, but finally everyone was well and we got to go. Julia, Elena, Maeve, Aiden, and New Fish all came for the play time. The pool water seemed a little colder this week, but Emily had a good time anyway. 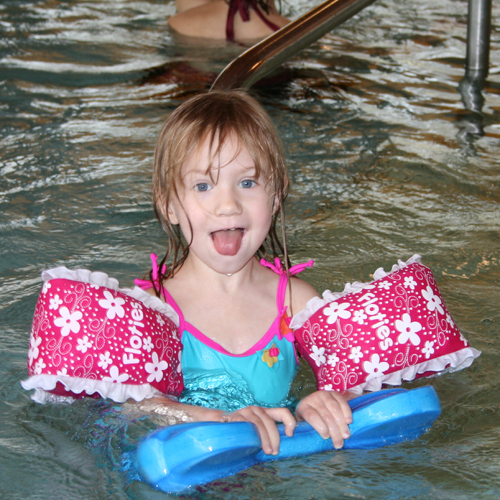 She played a funny game – she will swim to the middle of the pool with her floaties on and cry, “help, help me Mommy”. I would walk out to her and pull her back to the shallow section. She never was in trouble and in need of help, she just wanted her Mommy to play with her and figured this way would work. After swimming, we all went to Chick-fil-a for lunch and a cookie cake. Emily loves her chicken and fries (with catsup of course). The kids all had a good time. To cap off the good playtime, Emily played in the playarea and successfully climbed up to the top of the playground toy by herself.